Future Seed: Bridgestone Pavilion. – architectkidd co. ltd.
January 3, 2012: The Bridgestone Pavilion for the upcoming BOI (Board of Investment) Fair has recently been introduced to the public. The pavilion will be open to visitors during January 5 – 20 in what is anticipated to be one of the largest public events held in Bangkok this year. Architectkidd has been involved in the design of the pavilion in collaboration with the exhibition, event management and construction teams. One of the interesting aspects of the Bridgestone Pavilion is the need to communicate a clear and integrated identity and image across all aspects of the pavilion. 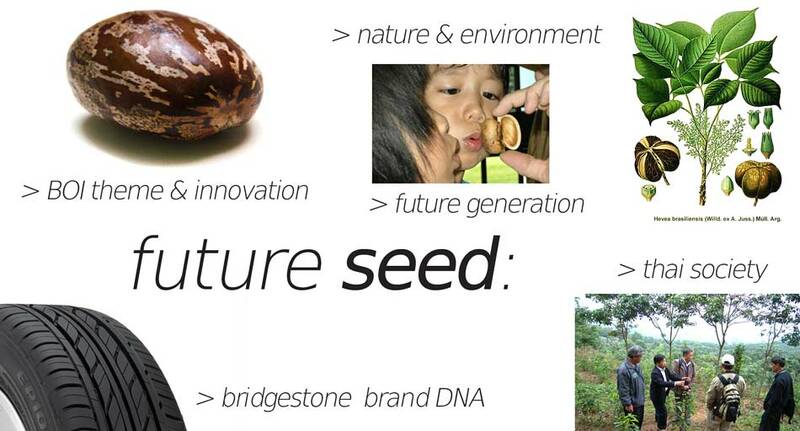 “Future Seed” refers not only to the pavilion design itself, but also Bridgestone’s desire to express sustainability and environmental commitments for its products, technologies and company vision. The “Future Seed” concept provided the opportunity to implement some sustainable features that may not have been otherwise feasible. 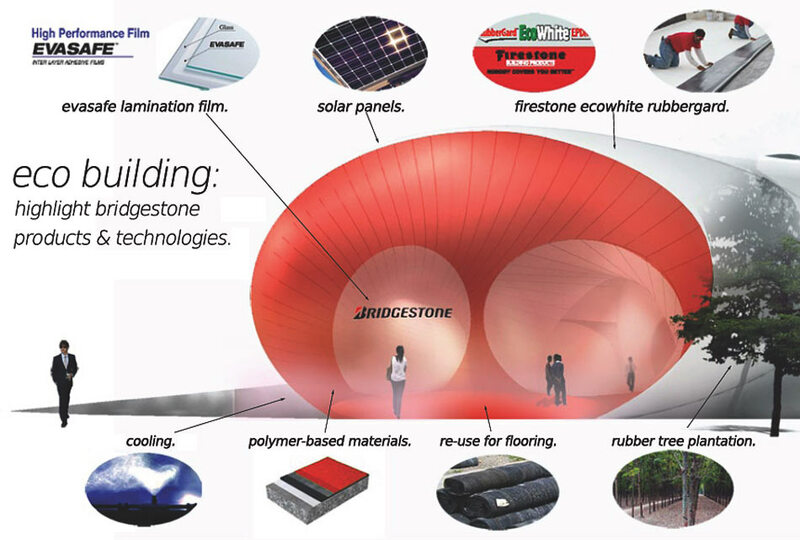 Working with Bridgestone allowed us to access their polymers expertise in many different shapes and forms. As leaders in EVA technologies, one feature of the pavilion is the use of heat-insulating film laminated on all glass windows and doors. Bridgestone also supplies materials for Panasonic/Sanyo solar panels that will be installed on the roof of the pavilion. The illustration below summarizes some of the proposed green features of the building. 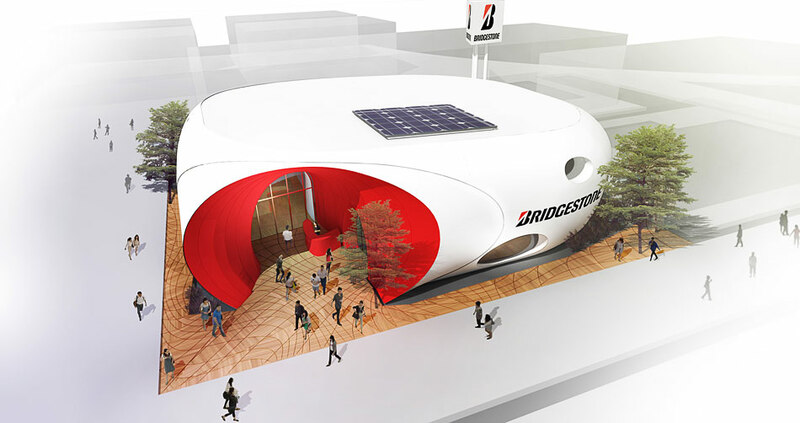 Other aspects of the Bridgestone Pavilion that relate to the “Future Seed” concept include new technologies and products displays that show how Bridgestone products originate and are inspired by nature. The exhibition design is by DesignLAB and construction coordinated by Pico. Stay tuned for more updates on this project from us very soon. For more information about the BOI Fair please visit their website here. Information about the pavilion from the Bridgestone Group can also be found here.